NCmatic is Siemens PLM partner in the field of Software and Technology. We are implementing our solutions with full access to Siemens PLM integration technology. NCmatic provides products that extends the functionality of the base NX and it tightly integrated with it. Features of NCmatic Work Instruction template, which are not available in base NX, makes our template unique among other created with traditional methods. 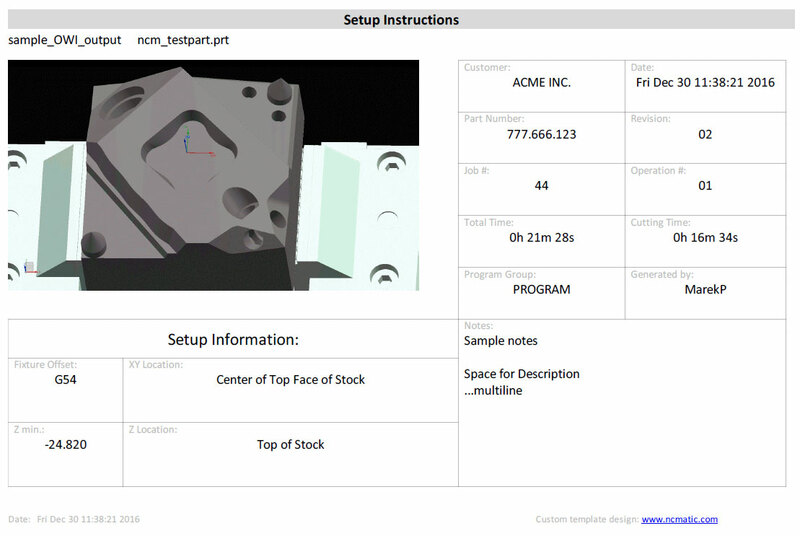 Consulting with experienced NX users and machinists, we have developed a package of exactly what should be displayed on each Work Instruction Template sheet to make operations easier. Each template contains exactly what you need in a clear, concise manner for any shop floor environment. Major convenience, available only in our template is automatically generated illustration of each tool. 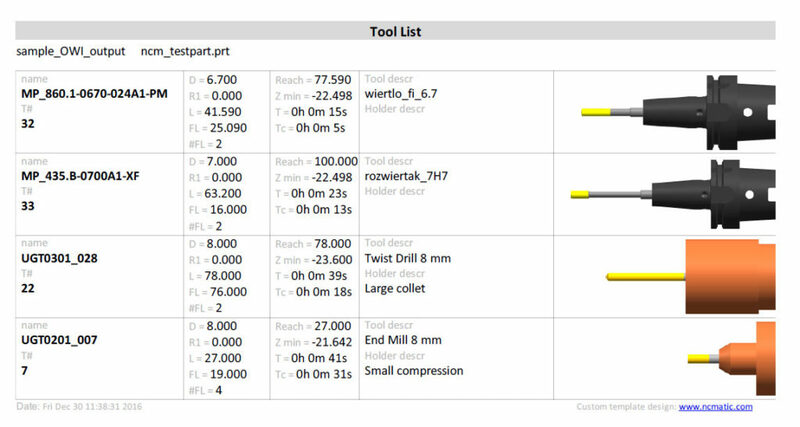 Tool list enhanced in this manner makes it easier to avoid mistakes during assembling tool set. Another very useful for operator information is minimum value of “Z”, which is the lowest level at which tool is used. On the tool list you can also see an information about the entire time how long each tool is working in program and time of cutting motions only. This helps calculate how many parts you can make with one tool or one set of cutting inserts. 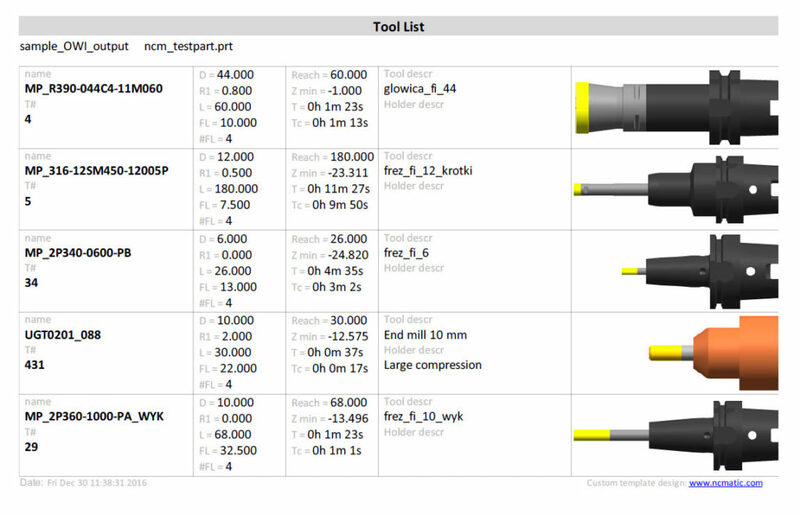 Setup Sheet includes transparent and complete set of information about machining process. Consistent and categorized design of Setup Sheet allows to keep all needed information in one place, while all information stays in perfectly readable form even in workshop environment. Information about minimum value of “Z” in entire program is helpful during mounting part on a fixture. It helps to avoid collisions between cutting tool and a fixture. NCmatic Work Instruction template utilizes and enhances the standard NX Work Instructions, which allows user also to enter some data manually. This data can be entered at any time before generating final documentation. Your data modifications are stored within the Work Instruction operation to eliminate the inconvenience of re-entering data every time. Last but not least is the list of operations. This detailed description of each operation gives you one more chance to prevent possible errors at the final stage – just before the program is run on the machine. Our distinctive illustrations of the current shape of the IPW (machined part) gives the operator an idea of what each subsequent operation will be, as well as how and which part details will be machined.